ARLINGTON, Texas (AP) The Texas Rangers have placed first baseman Ronald Guzman on the seven-day concussion disabled list and recalled utilityman Ryan Rua from Triple-A Round Rock. 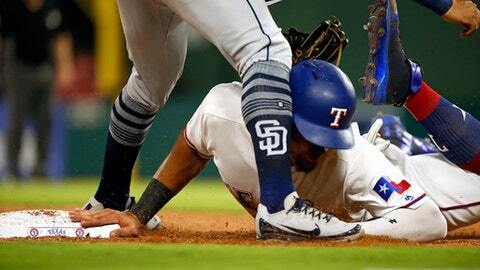 The Rangers made the move Tuesday, a day after Guzman left in the sixth inning of a 7-4 win over San Diego after his head struck the knee of third baseman Christian Villanueva when the rookie was diving back on an attempted pickoff. Rua, who was on the opening-day roster, is set for his fifth stint with the Rangers this season. Primarily a left fielder and first baseman, Rua has a .163 average with two home runs with the Rangers and is hitting .236 with three homers in Round Rock.